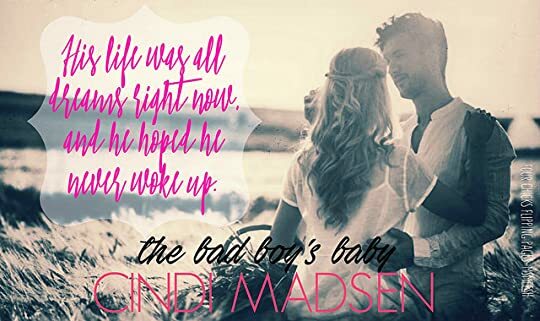 The Bad Boy’s Baby by Cindi Madsen was a sweet, heartfelt tugging romance that will be sure to leave readers smiling big. This is the second book that I have read from Cindi Madsen and so I was excited to be reunited with the cast of Hope Springs. There is something about small town romance that I find so charming and sweet and Ms. Madsen reminded me once again why I enjoy reading her books. In The Bad Boy’s Baby, Ms. Madsen introduces readers to Emma Walker who had a one night stand with the town’s bad boy. And this one night stand led her to being pregnant. Fast forward to two years later, Emma is juggling her career, taking care of her grandmother, and being a mom to her daughter Zoey. With very little time, her love life has taken a back seat. But what happens when the town’s bad boy comes back home for good? How will Emma react when Cam Brantley discovers that he is a father? When Cam Brantley comes home from the end of his miltary tour, he is welcomed with big news. He is a father. Taken aback by the sudden news, Cam decides that he will step up and be involve in his daughter’s life. While he gets to know his daughter, Cam and Emma soon begin to develop feelings for one another. As their feelings deepen, what happens when Emma is offered a job opportunity in another state? Will Emma be able to leave Cam in pursuit for a better job opportunity or will she chose love? Like I said before, I really enjoyed reading Cindi Madsen’s books. I love when an author can make her characters lovable from the start and that’s what she did with this book. She allowed readers to see and feel the different perspectives of Cam and Emma. Yes, they could have made different choices in life but these choices led them to become the person they are today. The Bad Boy’s Baby is a sweet, touching romance that weaves second chances and love in such a raw perspective in which allows readers to relate to these flawed characters. With her fresh, light, and clean writing, Cindi Madsen was able to capture a beautiful love story that transpired and united two unlikely people.